On January 29, 2018, more than 398 people attended a community meeting to learn more about proposed redevelopment at the ShurSave IGA site, mediated by Bloomfield Development Corporation as part of our Community Process for New Development. The numbers make it clear that this site is central to the identity of Bloomfield; attending the meeting were 286 Bloomfield residents, 13 business owners, 33 residents of other neighborhoods, 50 people from unknown neighborhoods, and 6 elected officials or representatives. In the days after the meeting, more than 60 Bloomfield residents reached out to Bloomfield Development’s office through calls and emails, and the Facebook Live video of the meeting reached 3,000 views. Attract a retail grocery store similar to the scale and lower price structure of Aldi, Trader Joe’s, Kuhn’s, or Lidl. A minimum of 15%, but a goal of 25% truly affordable housing units to include a mix of 50-60% and 80% Area Median Income (AMI). Affordability means that less than ⅓ of income will be spent on housing. Units priced at the exact top dollar amount of the 80% AMI range will not be considered affordable for that income range. A development of this scale that does not include 50-60% AMI does not respect or reflect the diversity, history, and context of the Bloomfield neighborhood. Structured parking will be included in the building as well as a commitment that residents may not apply for the Residential Parking Permit (RPP) program. The developer will support the expansion of parking enforcement hours surrounding the development. In addition, the developer, through architectural design and resident incentives, shall encourage the use of alternative forms of transportation, reducing the number of personal vehicle trips in and out of the development. Strategies include offering residents public transit subsidies, incentives for residents who do not own a car, Bike Share memberships, car-share memberships (ZipCar), secured and covered bicycle parking, covered bus shelters, etc. 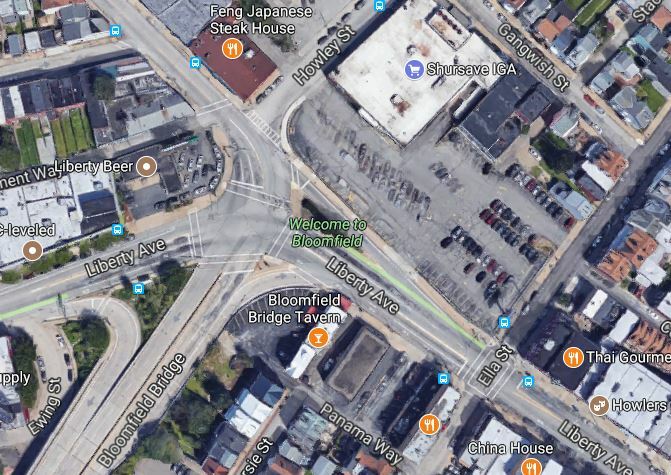 Investing in resources and working with the community and city towards a holistic plan for the Bloomfield Bridge intersection, particularly as their plans or possible anticipated future plans may impact the intersection. Investment shall also include improvements for pedestrians and cyclists around the site and within the intersection to create a multi-modal development. These improvements include curb cuts/ramps, high visibility crosswalks, pedestrian scaled lighting, street trees / plantings, etc. Additionally, community members made clear that a design more sensitive to the context of Bloomfield generally and the Liberty Avenue business district specifically, is needed. This site is one of the most visible in the neighborhood and as such, must reflect the historical design context in which it is situated, taking design cues from the Liberty Avenue and Main Street business districts that it is part of. Our staff and board of directors commit to advocating for the inclusion of the above-outlined components identified as critical through a public, transparent, and accessible community process. We pledge to support the property owner in meeting his goals while working towards a resolution at this significant community site that reflects the character and needs of the community. Bloomfield Development Corporation is a 501(c)3 nonprofit that works to support, promote, and enhance Bloomfield. The organization focuses on housing support, business support and promotion, and consensus building, and is committed to elevating the voices of residents and business in new development processes, acting as a mediator between the community and developers, and advocating for community-benefitting solutions. The ShurSave IGA public process involved physically flyering approximately 2,500 residences and businesses, receiving and responding to over 60 phone calls and emails, and creating numerous social media posts.